This stunning summer weather has made riding a pleasure – long hours of daylight make it perfect for exploring, no dirty bikes to hose off, and no muddy clothes to chuck in the washing machine. Places that in winter were an icy, slippery quagmire, or a gale-lashed hill, are magically transformed in the summer months into a picturesque rural idyll. Arriving at Barbury Castle early on Saturday the car park was almost full, with mums dropping off nervous-looking kids about to set out on a team-building mission. I bumped into Michael Duller, who was out on the road bike, and we chatted about the amazing Land’s End – John O’Groats ride that he, Graham and Gary from MB Swindon had recently completed. Debbie was the first of my ladies to arrive, followed by a welcome new (old) face in the form of Fiona, an MB Swindon member of old, proudly showing off Celeste, her new Giant full-sus. Trudy, Amanda, Sarah and Caroline soon followed, and off we headed down to Smeathe’s Ridge. The long, grassy run and far-reaching views from here never fail to lift the spirits, and we bounced our way happily to the gate at the end, Fiona using all her cattle-wrangling skills to move a herd of young cows out of the way. 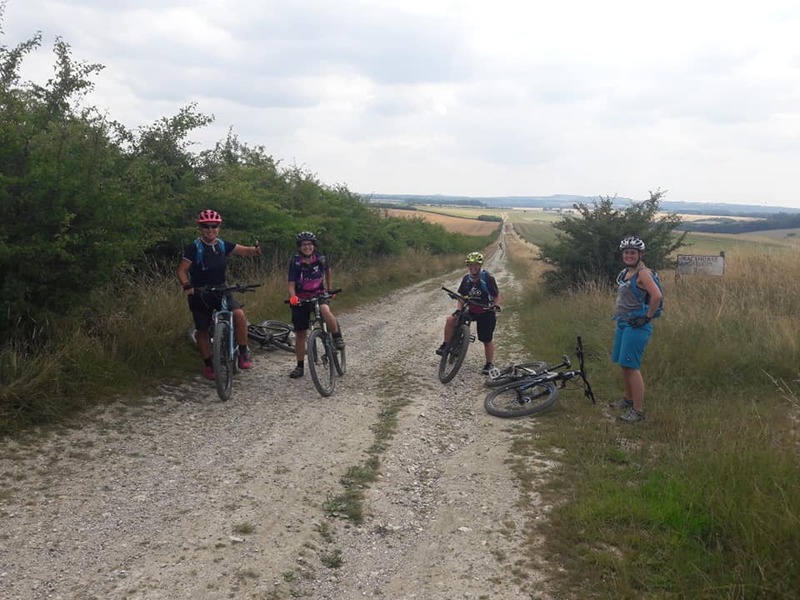 We followed the Ridgeway through Ogbourne and across the main road, picked up the old railway path and headed to Marlborough. 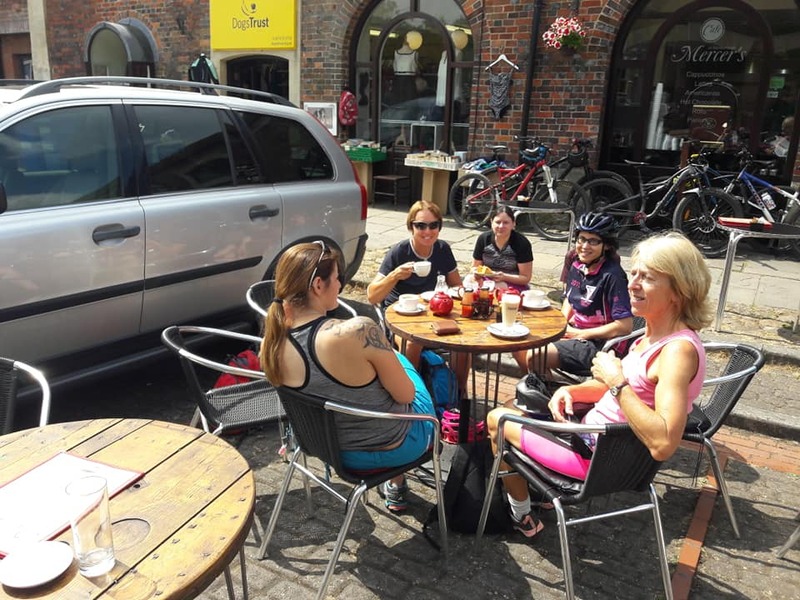 Stopping off at Mercer’s café for food and drink, we sat in the sun and ate vast slices of cake – it’s one of the better café stops, and always reliably good. 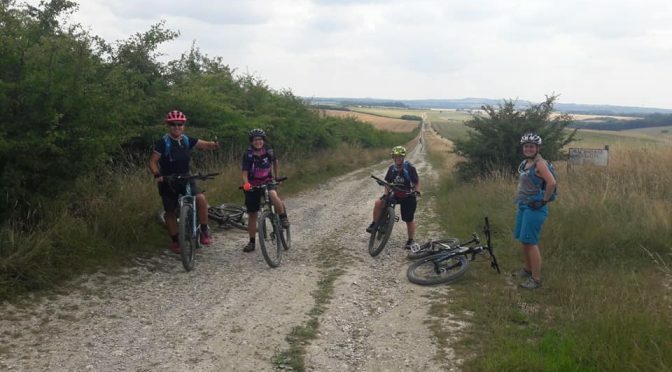 After refuelling, we made our way down the High Street, up Hyde Lane and past Marlborough Common, turning off to ride along Manton Down and on down the track to Rockley. There’s a nice little bit of single track, with some small jumps and drop-offs, in Rockley woods, and some of the girls had a bit of a play here – some light relief before everyone’s favourite (!) climb up Four Mile Clump back to Barbury Castle. There’s nothing for it here but to settle in and ‘love the hill’ and enjoy more of those gorgeous views. The temperature by now was well up in the high 20s, and there were some sweaty brows by the time we arrived back at the car park! We did a leisurely 16 miles – thanks to the lovely ladies who attended. See you next time!